Introduce your students to the most progressive thinking about organizations today as acclaimed author Richard Daft balances recent, innovative ideas with proven classic theories and effective business practices. Daft's best-selling ORGANIZATION THEORY AND DESIGN presents a captivating, compelling snapshot of contemporary organizations and the concepts driving their success that will immediately engage and inspire your students. 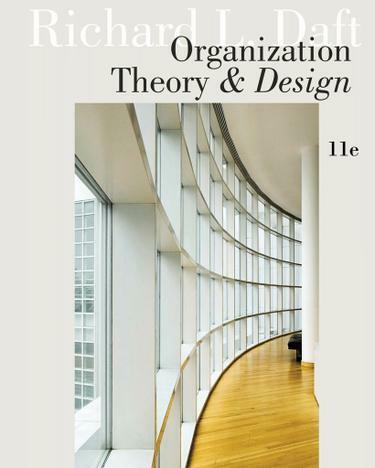 Recognized as one of the most systematic, well-organized texts in the market, ORGANIZATION THEORY AND DESIGN helps both future and current managers thoroughly prepare for the challenges they are certain to face in today's business world. This revision showcases some of today's most current examples and research alongside time-tested principles. Students see, firsthand, how many of today's well-known organizations have learned to cope and even thrive amidst a rapidly changing, highly competitive international environment. Featured organizations include BP, Disney/Pixar, Volvo, Barnes & Noble, and Cisco Systems. Organization studies, proven cases, and illustrations provide the insights necessary to better understand modern organizations, while new and proven learning features give your students important opportunities to apply concepts and refine their personal business skills and insights.